Looking up at mountains, people now see bare, dark rock where white snow and ice once stood—dramatic evidence of the accelerating pace of glacier retreat due to climate change. This groundbreaking work is the first to provide an integrated, multidisciplinary, global exploration of the scientific, social, and economic dimensions of this phenomenon. 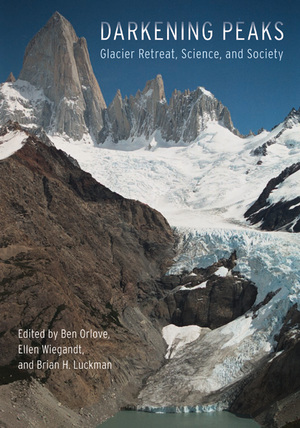 Bringing together contributors from five continents, Darkening Peaks discusses the ways that scientists have observed and modeled glaciers, tells how climate change is altering their size and distribution, and looks closely at their effect on human life. Ben Orlove is Professor of Environmental Science and Policy at the University of California, Davis and Adjunct Senior Research Scientist at the International Research Institute for Climate and Society at Columbia University. His books include Lines in the Water: Nature and Culture at Lake Titicaca (UC Press). Ellen Wiegandt is Lecturer at the Graduate Institute for International Studies in Geneva and Senior Researcher at the University Institute Kurt Bösch, Sion, Switzerland. She is also the editor of Mountains: Sources of Water, Sources of Knowledge. Brian H. Luckman is Professor of Geography at the University of Western Ontario, London, Canada.